Baby swings. Some are great. Some are ineffective. And some break easily. Sure you could drop $160 on a baby swing that doesn’t help your baby sleep and breaks 3 weeks after you bought it. But let’s face it – you just had a baby. You’re going to need that money for Starbucks and takeout. A safe, reliable swing with enough motion to help your baby sleep. Toys and music. We’re using the swing as a sleep-aid which means we’re NOT going to use it as a baby amusement park. Also we know that white noise helps babies sleep better so we don’t care which swing plays better music. And finally most baby swings produce music/white noise on a timer which means your baby swing will likely NOT be your source for white noise (unless your baby takes 7 minute naps in which case you’ve got bigger problems than picking out the best baby swing). They’re small. If you’re living in a 500 sq ft apartment in lower Manhattan then a full-sized swing may simply not be an option for you. They’re cheap (about 50% less than a full-sized swing). They don’t tend to help babies sleep as well as full-sized swings. Bigger swings result in more swinging motion which tends to be more effective for helping babies sleep. Swing timer = FAIL. Travel swings often only swing for a set amount of time which means both you and your baby will be waking up every 45 minutes all night long when the timer shuts off. They’re very low to the ground. While the weight limit is 25 lbs (roughly the same as that of a full-sized swing) if you have a tall baby you may find their heels dragging on the ground within a month or two. Bottom Line: In general I don’t recommend travel swings for baby sleep. If money is really tight you would probably be better off finding a lightly used recent-model full-sized swing on Craigslist. They have good full-range swinging motion which is most effective to help babies sleep. No timer on swinging. Yay! Some models are available with electrical plugs which spares you and the environment the pile of batteries you’ll be producing otherwise. They can safely and comfortably hold a baby from birth to 8+ months of age. They’re pricey. Expect to pay anywhere from $99 – $160 online and $140+ in local stores. They’re big. While technically they fold up a) folding them only makes them about 20% smaller and b) you’ll be using it so often it won’t get folded up until baby is sleeping in her crib and you store it away in the basement. They’re loud(ish). Having a baby swing swinging full-bore inches from your bed will take some getting used to. Using loud-white noise will help. They eat batteries (if using batteries). If you’re the swing full-time, expect to replace 4 D-cells every 7-10 days. Rechargeable batteries won’t work. They’re heavy-ish. If you just had a C-section you won’t appreciate having to move this around. Graco baby swings have the advantage of a 5 point harness and the highest weight limit (30 lbs) of any swing on the market. However they also have notoriously underpowered motors which are prone to burn out. I have found that Graco customer service will send you a replacement motor (they’re surprisingly easy to swap out) for free. However if your little one needs a swing to sleep, waiting for your replacement motor to show up in the mail can make for a rough couple of days. Fisher Price is adding something called “smart swing technology” so all their swings moving forward. While “smart swing technology” sounds like something you would want, in actuality it’s just a fancy term for “swings on a timer.” So all swings will automatically shut off every ~4 hours. For younger babies this will probably not be an issue and many babies are done sleeping in swings by ~3 months. However if your baby really needs that motion you may find that the timer is the bane of your existence with baby waking up every 45 minutes all night long. While you can still buy non-smart swing technology swings in stores, it’s going to be increasingly difficult to find Fisher Price swings that don’t turn off on a timer. So sadly, because of this, Fisher Price is no longer my all-time favorite baby swing. Boooo! I love the Fisher Price Papasan swing. They are cute, effective, and reliable. It can be adjusted to swing in two directions (although front to back is generally best). The only downside is that the 3 pt harness is slightly less desirable than the 5 pt harness. Although I have never personally worked with a baby that has managed to get out of the swing (and if you snap the tray in place it would be VERY difficult to do so). Some of the models have a mesh decoration that hangs around the swing. Although I’ve never had an issue with this, for sleep safety, I don’t recommend having loose fabric anywhere near babies. You can avoid this by choosing a model without this decoration or cutting it off the one you have. But let me be clear – this is my favorite baby swing, bar none. To be honest I have no personal experience with this brand of swing. They make a variety of travel swings available for ~$60 and full-size swings for ~$120. Do you have one? How’s it working out? Problem: Your little one habitually falls asleep seconds before you pull into the driveway. If you pick him up to bring him inside he won’t quietly fall back asleep in his bed/swing but will tell you in no uncertain terms that he is DONE napping now thankyouverymuch. If you sit in the car he’ll happily take a solid nap in there but for various reasons (it’s bad for the environment, it’s boring, YOU can’t nap in the car, you have to go to the bathroom, etc.) this is not a desirable option. Solution: Graco doesn’t make a traditional travel swing but they do have this nifty invention which holds a SnugRide car seat enabling you to make a swing out of your infant car seat. Most people don’t really need one of these as your baby will primarily be sleeping in their swing. However if your baby falls asleep in the car and you can’t avoid driving near nap time (when baby is prone to fall asleep in the car) the SnugGlider MAY be the answer for you. When your baby falls asleep in the car simply remove baby and carseat from the car and snap into your SnugGlider (best located somewhere near-ish to the car). Turn on the white noise, vibration, and swing and let the car nap continue inside. At $50-$60 a pop, the SnugGlider is not a “must-have” item for people who aren’t frequently driving their newborn baby around. But if you find yourself camped out in your car while baby sleeps, it maybe a worthy investment. The Zen Collection swing by Fisher-Price works similar to Graco’s SnugGlide. It basically allows to take the baby with you to another room without extracting her from the seat. As there are stands on the bottom of the seat it can serve as a baby chair. It is, however, quite heavy. They’ve implemented “smart swing” technology which sounds really exciting right? But what it MEANS is that any new swing with “smart swing technology” on the label will TURN OFF after like 45 minutes. And going forward ALL Fisher Price swings will feature this technology. I posted about this on Facebook and asked FB about it on twitter but got no response. So you can either buy a non “smart swing” swing as they still exist in stores (but they’ll be increasingly hard to get) or buy a Graco swing. I’m really enjoying your website, lots of good info. I’m spreading the word to my Mommy friends. Trying to get my 6 week old son on a sleep schedule and your advice it really helping – Thanks! I know that you are completely bombarded with questions daily from a million desperate parents, each with their own unique situation, but I’m going for it anyway…I’m that desperate. 1. Is he refusing to go back to sleep in the crib bc reflux is still an issue? 4. Should I get rid of the paci before getting him out of the swing completely? We tried a crib wedge and all that did was have him sliding to the bottom of it, so it was pointless (as I think you’ve said somewhere on here). Anyway, if you are able to offer any advice thank you–if you’re not, thank you anyway. You’re site has been a great resource and I don’t think I would’ve stayed sane for the first 5 months without it. 1) Stop using the paci at bedtime and during the night. Full on. 2) Gently wean those 2 feedings. Food and sleep are not a good combination for refluxing kids – empty tummies help refluxers to sleep flat on their back. This should take no more than 7-14 days? 3) Move to crib. Don’t give up after 1 rough night. A bit of back patting is OK to help with the transition but be mindful that you aren’t doing it so much it’s habit forming. And if you DO pat, make sure you’re patting less each subsequent night. Commit to a 5 night crib trial. Come back and let me know how it goes – OK? Thank you so much for your reply! We’re already working on getting rid of the latest feeding. One quick question on night weaning. When diluting the bottles should I use 2 ounces less each night or give each drop in formula per ounce of water a couple of nights? Thank you so much!! Hi Alexis! 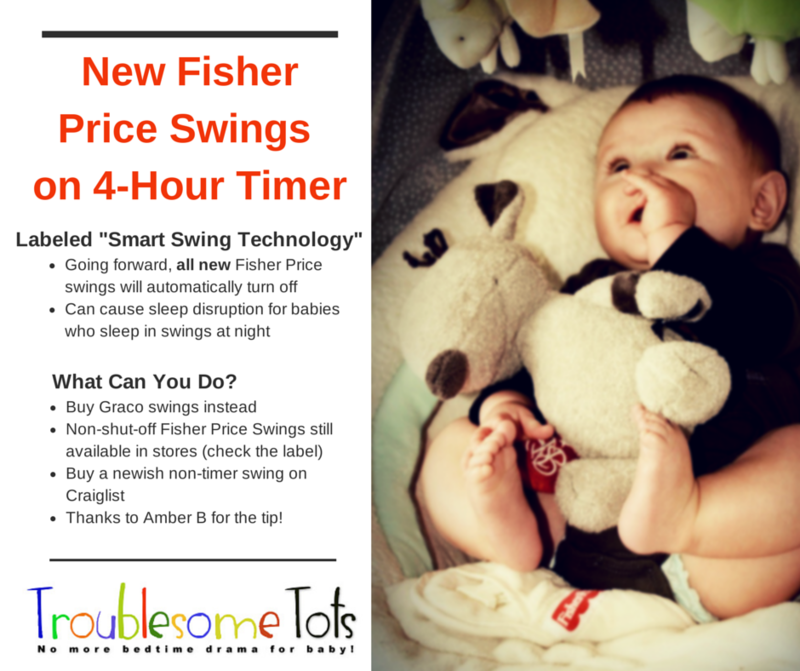 I’m confused about your update on the fisher price swing- does it turn off every 4 hours or every 45 minutes? I think I’m probably reading your post wrong, but it seems like you said 45 min in one place and 4 hours further down. I’m trying to decide between the Graco duet connect and a fisher price swing. Thanks! What swings do not have a timer/ shut off on their own? I’m having trouble finding that info when looking online. Thank you! I love this site and can’t wait for the book! My 4.5 baby needs motion and also needs to be swaddled to sleep best. So I’ve been putting her in thr mamaroo swing on the lowest setting and just kind of tying the straps around f her waist. We’ve been doing this since shes 5weeks but lately I stead of her usual 4 hr stretch from 6 to 10pm I started putting her to bed later at 7p and she gets up like every two hours and 40 min like clockwork. Wonder what I’m missing. .. it was working so well??! We recently brought our twins home from the NICU and purchased two Momaroos from 4moms.com before finding your blog. The boys seem to love them and have been sleeping 2.5-3 hours through the night in them for the most part. Now I’m wondering if we also need swings too, or if the Momaroos are equivalent enough. They’re $200/ea so I hope so! Also we’re already running out of room for all their things as it is. I got the Fisher Price My Little Snuagpuppy swing yesterday in a daze of exhaustion and set upon putting it together myself (and I am not handy so that tells you something about my desperation level.) I previously had the mamaroo and it pretty much did absolutely NOTHING for my kid. Strike that, it did do absolutely nothing for my kid. So a few things, the Snugapuppy swing I purchased does have “Smart Swing technology.” Whoops! Only read this post after I got it yesterday, but it keeps swinging for Peyton. It’s not stopping for us which is awesome. I’m wondering if maybe it senses his weight and keeps swinging vs. smaller newborns? Big boy’s 16.5 lbs so maybe that’s the difference? Either way, I will take it all. ALL OF IT. Because for the first time in 3 months my little man slept from 7pm until 4:30am. I could NOT believe it. I had to wake him up to feed. And he is falling asleep independently in it, which I cannot believe either. Your blog and this swing are a Godsend. I feel like a human being today after months of functioning on 2-3 hours sleep, with a baby who was waking 6-8 times a night and takes 30 minute naps. THANK YOU. I will now work toward the crib and weaning him off the swing. He started on level 4 last night and that was enough motion to get him there. I only wish I had discovered your blog and swing suggestions earlier! I tried unsuccessfully for weeks with the Baby Whisperer method of pick up/put down and was at the end of my sleep deprived rope, as was my sweet little angel man. So from both of us, THANK YOU!!!!!!!!!!!!!! I can now type this to you as Peyton naps happily in his swing (for about an hour and a half now) instead of me crying and pleading with my small fry to rest. Congratulations on getting your small fry to sleep! And sorry about the swing timer 🙁 I called to complain to them (as though I hold any sway with Fisher Price) and they fully ignored me. HOW DARE THEY! I hold the dubious honor of being the most famous baby swing sleep blogger in the world – LOL! Oh well…there’s always Graco swings? Hi Alexis, love your site, thank you for it! My question is are swings safe from as early as 1-2 weeks old? I had a sister who died of cot death in a car seat so to see her little neck even slightly flexed as compared with lying on a flat cot mattress makes me nervous. We are borrowing a bright sparks travel swing but may buy a F&P papasan (quite hard to find in NZ!). I appreciate we may be being impatient, she is still so new but my wife had a nasty C-section, I am going back to a busy job soon, and we have no other people around us (plus an extremely active 2 year old girl). We are getting quite desperate and really don’t want to bed share any more, hoping the swing helps (it seems to be so far). I would definitely talk about the swing with your pediatrician. Most modern swings (like the F&P) are almost fully reclined and thus aren’t that far off from the crib. However very small babies (preemies, etc.) should be FULLY reclined. So run it by your pediatrician. During the day you might have good luck with babywearing – it should help her sleep better and free up your hands to play with your 2 year old. In the evening you might want experiment with the swing in the earlier part of the night and see if it buys you longer stretches of sleep (it might or might not, hopefully yes?). If you’re comfortable co-sleeping I wouldn’t worry about forming sleep habits just yet. When she’s ~6 weeks you should see things start to get easier and 6-12 weeks is a great window to move towards the sleep environment you WANT vs. the one you currently HAVE. Newborns are rough, no doubt. But it won’t always be this hard. Good luck and tally ho! I’m wondering if any has tried the newer Graco gliders? They even make one with a bassinet that snaps in. I have a Graco swing from my first son, but the motor is definitely not working as well as it used to and I want to replace it before it goes completely. I tried getting a Fisher Price on Amazon that I thought was an old model, but of course when it was delivered it has “smart swing” right on the box. Super frustrating, but I guess it’ll have to go back. Hello Alexis! First off, I LOVE your website. I have been using it since having my first born in 2012. It has been so incredibly useful and has saved my sanity. I now have baby #2 who is almost 12 weeks. Before using the swing I had him in the carrier for all naps and co slept. His naps were about 1-1.5 hours, however he was up every 1.5-2 hours at night. After the swing he wakes up only 2-3 times a night, but his naps are only 30 minutes long. I have white noise, blacked out curtains, tried swings back and forth and side to side, swaddle, sleep with my shirt, never keep him up too long (about 1 hour and 15 minutes), and put him down awake. Should I take it for what it’s worth and accept his 30 minute naps? I guess it doesn’t really bother me.. But I feel like it’s always nap time!! Do you think the swing has anything to do with it? I have a FP papasan swing and I feel like the motor is going. Do you think that’s it? Your site is my favorite thing besides sleeping. We had a Fisher Price Snugga-whatever swing for our first child and she was napping in it until 7ish months. Swing worked great the entire time. OUR SWING IS BREAKING AND I’M FREAKING OUT!!! And the new fisher price swings, like you said, have a timer! What is this?! Do you have a new swing recommendation for us swing lovers out there? Or do we bite the bullet and get the new swing with the 4 hour timer (I think its 4 hours, right?). I love our swing and just don’t know if our 3 month old is ready to ditch it just yet. I’m definitely not ready!! New visitor to your site and man I love the content! Quick question – my son is nearly 3 months old and he too is a motion junkie like a lot of other babies mentioned here. Is it too late to buy a swing??? I ask because lately naps have been hellish as he just doesn’t sleep, except in the car or at night for 6 hours. I have a one month old that mostly sleeps only in hour increments at night unless he’s in our arms. He is not happy unless in our arms all in the day. I was looking at the swing you recommend as your favorite, but we wouldn’t be able to swaddle him while in i. He likes the swaddle and you recommend it highly for soothing so I’m unsure if we should do it. Thoughts on swing and swaddling? Our friends love your website and recommended it highly. We are expecting our first child and will be in a small city apartment for the first 5-6 months. We are looking to get a good swing, but are concerned about space. I see that this article is from 2014, and since then it seems some other products have entered the market. Have you seen/ tried the nuna leaf (with the wind to make it electric)? Its swinging motion is side to side instead of back and forth. I’d love to see this article updated with newer model reviews if you had time. Thank you again for all your work on this wonderful site. Hi Kelly! Just wanted to let you know, the fisher price swing also gives you the option of back and forth OR side to side. It’s been great for us, and for many of our friends with their babies as well. Good luck! Hello Alexis, thanks for the nice review. This should help those who are just coming into the world of baby products especially new parents. HI there, can anyone recommend which moel of graco swing is good? i was keen on the Fisher Price snug-a-bunny until i read Alexis’s review! It’s the only product that I’m aware of that reclines almost 100% and glides instead of rocking. It has a white noise setting (it’s pretty quiet so invest in a dOhm or other white noise source) and 6 speed levels. Two things to be aware of. 1: It has some balance issues. If you put the baby too far towards the back of the swing it will pitch up and down; not violently, but enough to keep you awake at night and disturb the baby’s sleep. If it pitches just move the baby towards the center. 2: The motor is whisper quiet out of the box, but after a few weeks of operation the motor begins to click rhythmically during operation, especially at lower speeds. I suspected this might be a defect with the item, but I called Graco and they replaced it, and I had the same issues. However, these issues are fairly minor, their customer service is responsive, and our daughter sleeps like a champ in it, so I still recommend it. You speak about the pros of a 5pt harness – but wondering what is safe if your baby needs to be swaddled? Swaddle with just the tray coming down? There is no way to 5pt harness a swaddled baby is there? Thanks! I have my baby in a bassinet at night and he I my sleeps up until around 5am in it, then he starts grunting and kicking and stretching and I’ll end up moving him to his rock and play. I am interested in this swing option but i am always seeing that to reduce risk of sids babies have to sleep overnight on a flat surface. Is the swing safe for overnight sleeping? Also, any tips on the grunting? He does this almost every morning between 4-6am, he grunts and kicks and waves his arms around. I try to swaddle and it helps with the kicking and arms waving around but not with the grunting lol! Not sure what he’s feeling when this is happening or how to help him.